Imagine never having seen a television show or a film in your life; and your first exposure comes in the form of First Blood! The undeniable impact of films is such that some times you’re never the same again after seeing one. For our protagonist in the film of choice at Susan’s on Monday, this was certainly the case. Thanks to Sylvester Stallone, and some brilliant child acting, Susan treated us all to the heartwarming feel-good coming of age tale that is Son of Rambow. We were treated to Pizza Hut’s finest, as a reward for half marathons (Di), hard work at school (Susan), a pre-MNFC swim (Jon), pregnant antics (Jess) and action-man emulation (Sam); after which we settled down to watch the 2008 movie that surprisingly was a first-time special for a few of the fascists. We were most glad to have Susan back following last MNFC’s last-minute change of venue, and she certainly delivered a fun evening for us all. Of course, the self-aware Skynet-inspired “smart” TV came with it’s own challenges (maybe forming a robotic rebellion with the X-box… watch this space). 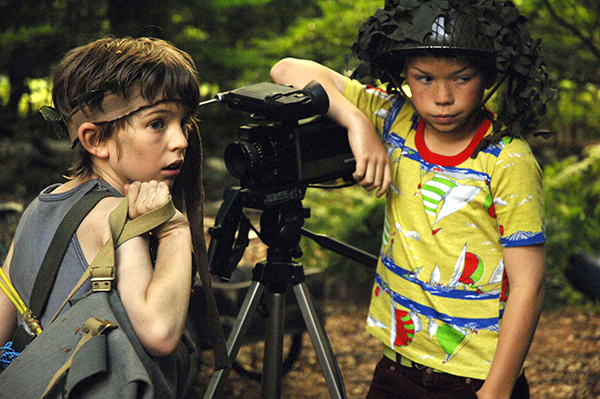 Son of Rambow is a British film set in the 1980s, about Wil Proudfoot, a boy from an un-named religious community, who being deprived of television is exposed to a screening of “Rambo:First Blood” by his schoolmate Lee Carter, who is making illegal knock-off films for his older brother. With his imagination in overload from explosions and weaponry, he forms a friendship with Lee, as they attempt to make their own sequel, to enter in Screen Test, an national competition for young filmmakers. We all decided that the film was full of great 1980s nostalgia, and lamented for our lost youths! Predictably, the chin stroking after the film became a trip down memory lane, reciting our own dear memories of our childhood TV encounters – particularly the CITV series T-Bag (which ran from 1985-1992). It made me also think that First Blood is due a good dusting off and revisiting, maybe in a future MNFC, who knows?! It’s hard to find too much trivia other than the reliable source of IMDB, however I can confirm that indeed it was Eric Sykes who we spotted wearing a rather dashing auburn wig. Critical review of Son of Rambow at the time of release was generally very positive, with particular praise going to it’s 2 main child stars. We also spent some time chin-stroking over how few British coming of age films there are, and this is certainly true compared to the American genre; who have teenage angst coming out all over the place with their perfect hair and teeth, and their High School Musicals. No review of this film however would be complete without an honorable mention of Jules Sitruk who played the oh-so-amazingly-French student Didier. Had we followed the character into his adult life, I’m sure we would have ended up with someone like this. So, we leave MNFC this week on such a high with youthful innocence… before lunging into the depths of terror and despair for the 3rd annual halloween Demon-ocracy. Be afraid, be very afraid. Until then, au revoir Angleterre!